Last week Garden Boy spent a morning with me in the garden, working really, really hard. 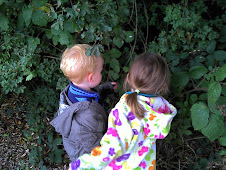 He pulled up a whole bucketful of weeds while he chattered to Garden Lass and the Ladybirds. He was having so much fun and was very proud of his work. When I eventually looked at my watch and saw that it was time to go and collect Garden Girl from school I suggesed he come with me to tip his weeds into the green bin. His face changed. His smile disappeared. 'We not throwing them out,' he pouted. 'Oh.' He had such downcast eyes and I felt so sorry for him. He had been working so hard because he thought he was digging up our dinner. He didn't eat his dinner that evening. I wonder if he was just too disappointed! Is this where you really confuse him and show him which weeds are edible? Poor honey! I find it very arbitrary myself over what is weeds and what isn't! Garden Boy would get on with that Alys Fowler!